The geometry axes represent a Cartesian coordinate system and therefore the declaration of a geometry axis as rotary axis leads to a definition conflict. Please inform the authorized personnel/service department. 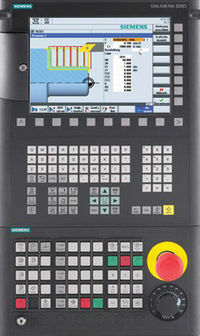 Remove rotary axis declaration for this machine axis. For this purpose, the geometry axis index for the displayed geometry axis must be determined by means of the channel-specific machine data array 20060 AXCONF_GEOAX_NAME_TAB. The channel axis number is stored with the same index in the channel-specific MD array 20050 AXCONF_GEOAX_ASSIGN_TAB. The channel axis number minus 1 provides the channel axis index under which the machine axis number is found in the channel-specific MD array 20070 AXCONF_MACHAX_USED.